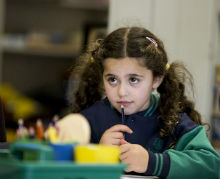 The transition from Kinder to Primary School is one of the most important change events in a child’s life. To ensure that this transition is positive and as smooth as possible, all future Prep students are invited to attend the Auburn South ‘Stepping Up to School’ Prep transition program. Details of the Stepping Up to School program for students commencing school in 2020 will be available, along with enrolment packs, from 7 March 2019.